Get up to HK$100 in supermarket voucher when purchasing an Individual Personal Accident policy of HK$200 or above in monthly premium*! Act now! Anyone can fall victim to accidents and illnesses. Are you well prepared if the unexpected occurs? With personal accident insurance our protection plan can help you face the future should you have an accident or fall ill.
What does Personal Accident Insurance offer? A lump sum payment should you suffer accidental death or disablement*. Plus reimbursement of medical expenses. Need more cover!? Add on more! Simply choose what additional cover you may need. Top up with Daily Hospital Cover or Critical Illness Cover for a small amount extra to your premiums. A little more cost for comprehensive cover for you and your family. Our plan provides you with a lump-sum payment for accidental death, dismemberment and permanent total disability within 12 months of an accident. ✔ Different levels of cover for you to select. We reimburse you for injuries sustained through an accident. We know how worrying being hospitalized can be, for example loss of income or the expense of good medical care. Top up your policy to include hospital income cover and we provide you with up to HK$1,000/ day coverage for each benefit including, daily hospital income benefit, intensive care unit benefit and long term hospitalization benefit. The sad truth is many of us will be diagnosed with a critical illness at some point in our lives, whatever age you are. We cover 47 different critical illnesses that commonly occur amongst Hong Kong people including, major cancer, stroke, heart attack and kidney failure. 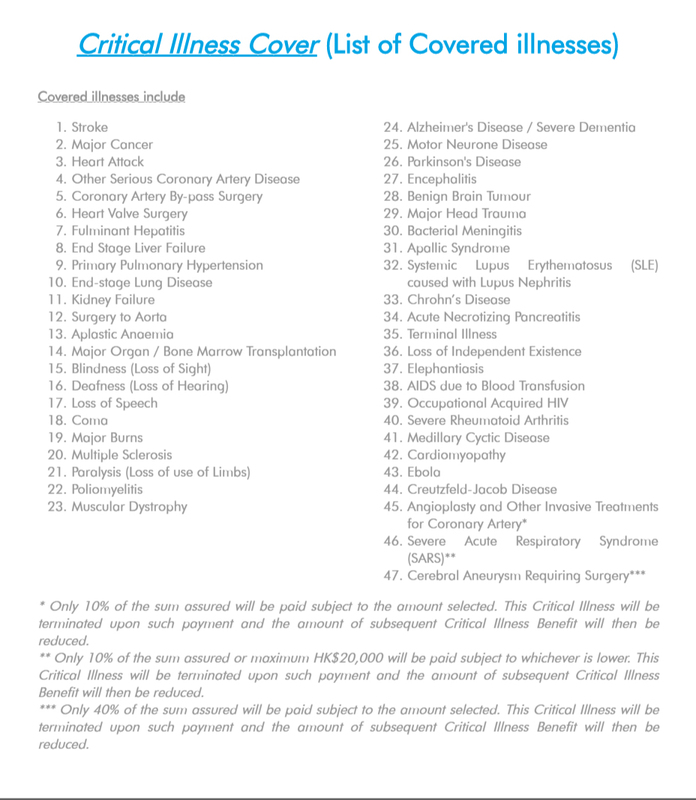 We provide a payment of 100% sum insured upon diagnosis of 44 of our covered critical illnesses. You can see our full list of coverage here. *The above information is for reference only. For the full benefit table, please refer to our policy wording ( personal accident / daily hospital income cover / critical illness ) or click here to get a quotation. For details of coverage, terms, conditions, and exclusions, please refer to the policy wording. In the event of any inconsistency between the English and Chinese versions of any of the above details, the English version shall prevail. Who is Personal Accident Insurance for? We have cover to suit you for small monthly premiums. Want to cover not only yourself but also your family? We have cover for you and your loved ones. *This is for reference only. For details of coverage, terms, conditions and exclusions, please refer to the policy wording. What is the age limit to purchase this product? Anyone aged between 18 – 55 is eligible to apply. Personal Accident Insurance provides a lump sum cash payment if you suffer an accident that leads to death, disability or dismemberment. The compensation can be used at your choice to pay for your treatments, provide financial support during recovery, or help your family. This product also provides accidental medical expenses benefit which reimburses you for the injury sustained through an accident. How can I tailor the insurance plan to meet my needs? You can choose to have the core cover, Personal Accident Cover, only or make it a comprehensive protection by adding extra covers such as Daily Hospital Income Cover and Critical Illness Cover. For each cover, you also get to decide the coverage level. It’s entirely up to your choice to select the amount of coverage you need. Is there any excluded occupation? You will not be covered under this insurance if your job or the nature of your job is one of the following excluded classes: blaster, jockey, detective, stuntman, stevedore, fisherman, driver (cross-border between Hong Kong and Mainland China), test pilot, circus trainer, aerial worker, caisson worker, lift technician, building wrecker, driller-underground, wild animal trainer, secret service agent, container crane operator, construction site worker, dynamite/explosive operator and government/state disciplinary forces. What is the policy payment term? IPA is a flexible and affordable insurance product. You pay the premium monthly, instead of on a yearly basis. What is the maximum age that the insurance will cover you to? Cover is provided up to the age of 65 years old. Making a claim is easy. You only need to fill the claim form and submit it along with required documents within 30 days following an incident. We will review and settle your case as soon as we can. What kinds of critical illness are covered? We cover for 47 different serious illnesses. You can see our full list of coverage here. The above is for reference only and does not form part of the insurance contract. For full terms and conditions and exclusions, please refer to the policy document itself which shall prevail in case of inconsistency. AIG Insurance Hong Kong Ltd. reserves right of final approval and decision. (The English version shall prevail in case of inconsistency between the English and Chinese versions).